On Sunday, as India marked the 128th birth anniversary of Dr B R Ambedkar, political parties apart, people in large numbers gathered at Race Course Circle in Vadodara city to pay obeisance to the Father of the Indian Constitution. In 1917, when Babasaheb Ambedkar returned to India after finishing his higher studies from London, he first came to Vadodara to work for the Gaekwad of Baroda who had given him the scholarship. But, being an “untouchable”, he found it difficult to get a proper lodging. He finally got into a Parsi inn where he was allegedly insulted by the lodge owner after his identity was revealed. Around 102 years later, the major political parties of India are fighting over his legacy, each claiming him to be their own, more so as the Lok Sabha elections have begun. On Sunday, as India marked the 128th birth anniversary of Dr B R Ambedkar, political parties apart, people in large numbers gathered at Race Course Circle in Vadodara city to pay obeisance to the Father of the Indian Constitution. Huddled in a corner, amidst the rush of political party workers, was a group of members from Dalit outfits of the city. Probably eldest among them, 79-year-old Sukhdev Gade waited patiently as political leaders queued up to climb a ladder to garland Ambedkar’s statue and pose for the cameras. Beginning with Mayor Dr Jigisha Sheth, followed by BJP and Congress leaders, including their respective candidates for the Lok Sabha elections Ranjan Bhatt — who is also the incumbent MP — and Prashant Patel, the list went on. There were leaders and candidates from other parties such as the Bahujan Samaj Party in attendance too. Gade, who runs Sakhiya Muni charitable trust, finally got his chance to pay tribute to his ‘real-life hero’ about half an hour later, while the leaders from the warring parties shared pleasantries over ‘Jay Bhim’ slogans. Another member from the community, Pruthvi Parmar (58), a retired government employee, who overhears the conversation seconds Gade. “We don’t need just Dalit MPs and MLAs, but leaders who can fight for the cause and not enter a state of hibernation for five years after being voted to power. We still struggle for equal opportunities in every field. In my view, if you actually want to provide equal opportunities, start from scratch — have the same kind of schools for everyone. Why have private and government schools? That widens the gap — then talk about upliftment,” Parmar says. 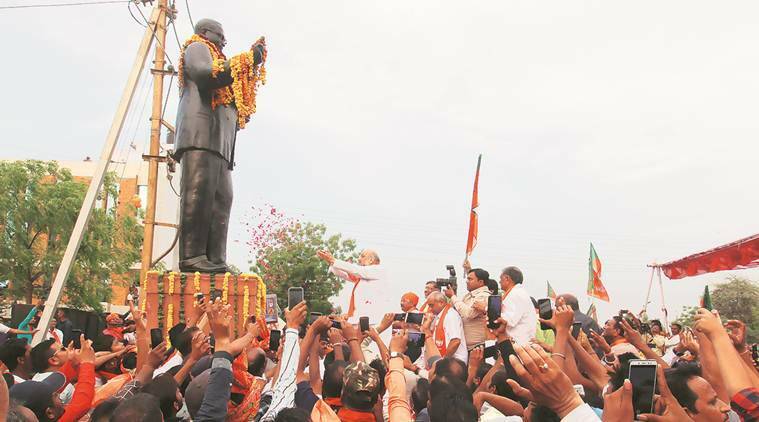 Meanwhile, the BJP carried out a ‘Bhim Yatra’ from its party office in Sayajigunj till the Race Course Circle, with a small bust of Ambedkar mounted on a jeep. The Congress, however, reached the spot simultaneously without any rally. Though the members greeted each other with slogans of ‘Jay Bhim’ and shared glasses of butter milk, the parties sparred over the legacy of Dr Ambedkar. Gunvantray Parmar, Secretary of Gujarat Pradesh Congress Committee and a Dalit leader said, “The vision that Babasaheb had for the backward castes and the country overall has not been fulfilled. At implementation level, the benefits are yet to reach those who actually deserve,” Taking his legacy forward means working towards the fulfillment of his vision, which the party is doing,” he claimed. On the other hand, BJP’s state secretary and Vadodara Deputy Mayor Jivraj Chauhan (54) claimed that the BJP had given due recognition to the social reformer, which the Congress had not. “Even Dr Ambedkar was against Article 370 like we are now. We have built five memorials for him at important places, including his birth place in Mhow. He was never conferred with the Bharat Ratna under the Congress regime. We did,” he said. In Gujarat, the Dalit community comprises 6.7% of the population. In the 2012 Assembly polls, the BJP had won 10 of the 13 seats reserved for the scheduled castes, but the count dropped to eight in the 2017 polls, while the Congress won four. One seat was won by independent candidate Jignesh Mevani in Vadgam. The BJP had won both the SC Parliamentary seats in the state in 2014. According to a survey by Delhi-based Centre for the Study of Developing Societies, on an average, one out of every four Dalit voters, voted for the BJP in the past elections.